Embossed pattern design on both sides. EVERYWHERE USE Great for: water fountain, eating rubber placemat, feeding station, elevated-automatic-gravity feeders, raised bowls, pet tray, food and water dishes, litter rug, spill and dirt catching, slow feed bowls, and more. WATERPROOF 100% waterproof means 100% protection against water and moisture for your flooring. And no more stains on the floor. EASY TO STORE AND TRAVEL-FRIENDLY Simply fold or roll it. It regains shape easily. Give it a try! For sure, it will become your pet’s favorite place inside or outside the house. 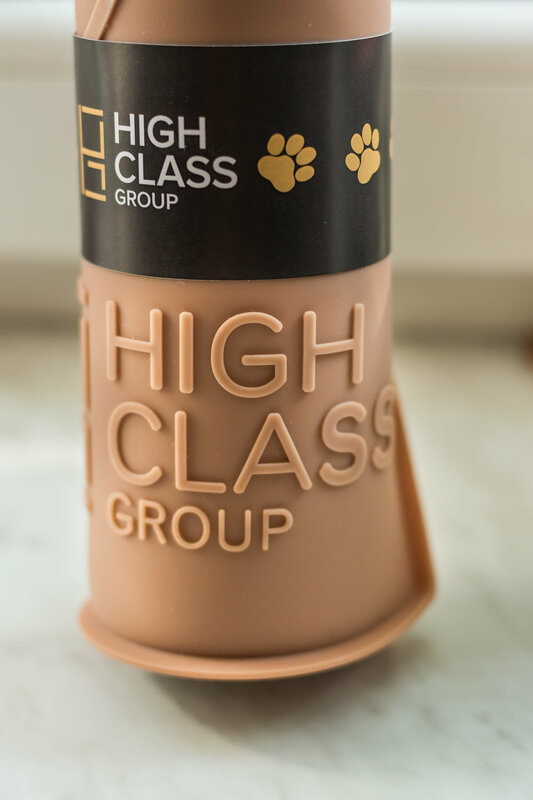 Here, at High Class Group, we proudly create, design and manufacture innovative, functional and high-class quality products that improve your daily life. We are on a mission to develop products that help people to enjoy more their life. And not only their lives, but also their cute pets’ life. We put enthusiasm and love in our work, that's why we carefully select our suppliers and materials. The result is deluxe products that fulfill special needs. 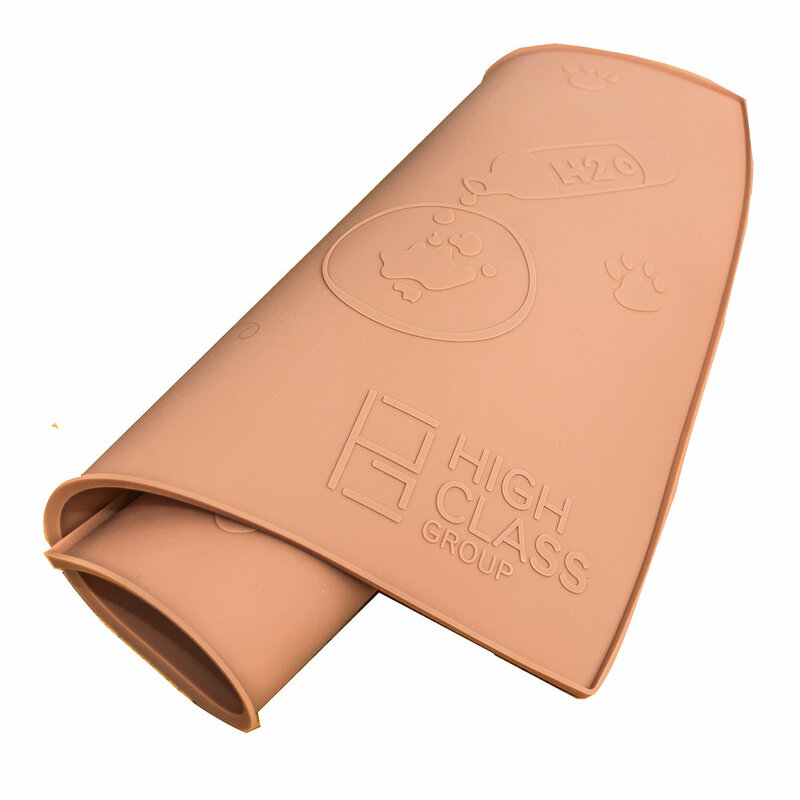 Our best-seller product is the Pet Food Mat made of premium FDA silicone, a waterproof mat with no spill and anti-slip design. 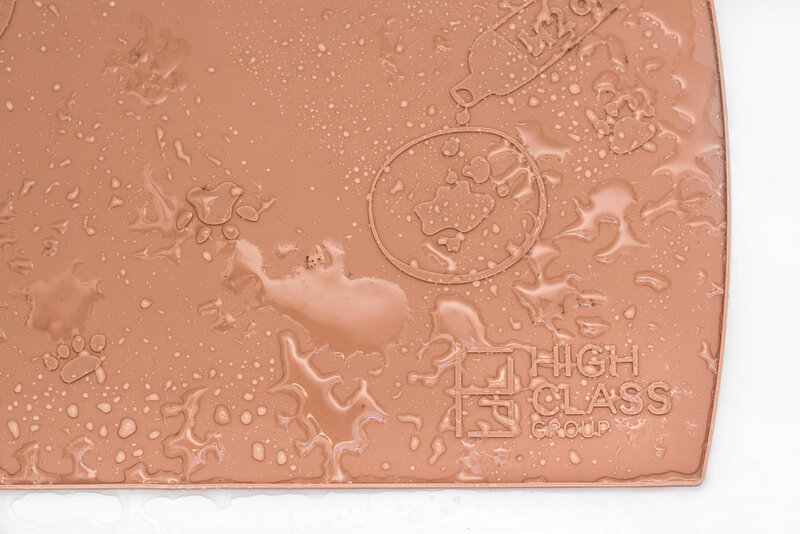 In the next years, High Class Group will introduce new products and improve the existing ones. Our customers' feedback is so valuable to us; based on your opinion and experience we can make better products, and we add new features to the current ones. Please feel free always to drop us a line. We are easy to chat with. Our customer service is one of our strengths. We answer each inquiry in less than 24 hours. Do you want to know what our customers think of our brand and our products? Enjoy just a few of our client's reviews. What exactly is the size of this large mat? 24 x 16 in (L x W) with a 0.30 inch raised lip all around. In which country is it manufactured? Does this mat slip on polished surfaces (laminated/wooden floor, slick ceramic tiles)? It has smart features like anti-slip bumpers (bottom) and stylishly embossed patterns (top) to prevent bowls from sliding and mat from slipping, as well as raised outer lip to catch food and water that escape bowls. Does it have straight edges? Out of respect for our pets, we have created straight length edges, so it could be placed near a wall or piece of furniture, and slightly curved width edges to avoid positioning of our loved pet inside a corner of the walls like a naughty child punished in state schools. Yes, the food mat can be placed in the dishwasher for cleaning and although it can withstand a lot of heat, we would recommend you place it in the upper rack to avoid the risk of direct contact with the heating element. We also recommend placing (or folding) it facedown, as hot steam will work best to clean the upper surface of the mat this way. Can pet eat directly from the mat? Sure, the mat is made of 100 p.c. Premium FDA grade silicone, non-toxic and non-allergenic. Yes, it is made of durable material and stands up well to repeated use. It can be used both indoors and outdoors. What size / type of feeders fit this mat? It fits 99 p.c. elevated dog feeders and pet bowls on the market - 4"-12" dog or cat bowls, 20” elevated pet feeder, pet water fountain and other feeders. Be sure to use your coupon on the date listed in the email! These coupons expire if your goes unused on that day! Your promotional coupon will be sent to your inbox shortly.